Offer is valid only in Pune. Columbia Asia Hospital Pune, is a 100 bedded multi-specialty facility situated close to the IT Parks at Kharadi. The hospital has highly qualified medical personnel and technicians to ensure healthcare delivery of the highest quality. It offers a wide range of clinical services such as cardiology, obstetrics & gynecology, minimally invasive surgeries, medical and surgical oncology, pediatrics and neonatology, ophthalmology, urology, gastroenterology, renal transplants, orthopedics, joint replacements, plastic surgery and bariatric surgery. The hospital s infrastructure along with internationally benchmarked standards of medical, nursing and operating protocols are the key components that will make it a preferred hospital in Pune. A proprietary hospital information system and electronic medical record management assures error free and convenient patient records management, thereby greatly minimizing patient waiting time. 2. Valid at Columbia Asia Hospital, Pune. 5. Package Inclusion: Hemogram, Blood Group & Rh Factor, Blood Sugar Fasting, HBA1C, Lipid profile, Urine Routine, Stool Routine, Serum Calcium, Physician Consultation, Nutrition Counselling, X-Ray Chest, ECG, TSH, Liver Function Test, Serum Creatinine, USG Abdomen & Pelvis, Treadmill Test, Breakfast & Dental Screening. 6. 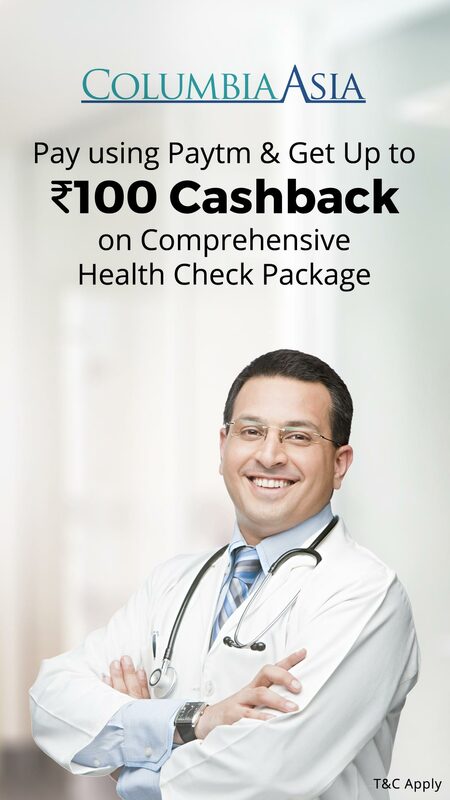 Comprehensive health screening package for men (between 30-40 years) worth Rs.5100.